Commercial Pest Control Sacramento: Do You Need Commercial Pest Control Services? If we have said it once, we have said it a million times: you simply cannot afford to not have a pest control company on your side if you are the owner of a commercial business. We’re not really sure why, but it seems that most people are extremely concerned about getting pests out of their home, but many people never really think about how important it is to not have pests in their business space. We will chalk it up to a bit of an oversight, but regardless, we will continue to forge ahead and press how imperative it is that commercial pest control is one of your top priorities as a business owner. Believe us, we understand that you are constantly having to find more and more money in your budget to ensure that your business runs smoothly. However, while some things may be able to be put on the back burner from time to time, making sure your commercial space is free of pests is simply not one of them. Even if you have not initially made pest control a priority for your business, it’s time to start taking it seriously and we are going to tell you precisely why. 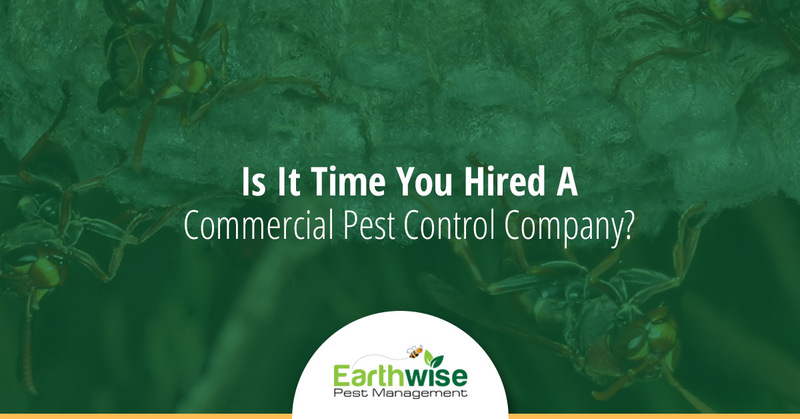 Continue reading below to learn why your Sacramento business needs the help of the experts at Earthwise Pest Management. The first thing you need to realize is that keeping a pest-free facility is great for your overall business revenue and reputation. There isn’t a customer on the planet who wants to purchase items from your business if there is a pest problem in it. Not to mention, one customer spotting a pest in your space could lead to a bad reputation that will spread like wildfire and may ultimately lead to you no longer having a business to run at all. Plain and simple, people do not trust a business that does not have the foresight to make sure that there aren’t pests running rampant in the facility. This shows a lack of caring and a complete disregard for the safety of both customers and employees alike. Therefore, if you want your business to survive, you’re going to need to hire a professional pest control company to have your business’ back. There are some businesses in which a fly occupying the space isn’t going to be the end of the world. However, there are others where something as small as the mention of a pest can send people reeling. Yes, we are talking about restaurants. There is simply no way to keep customers happy in a restaurant setting if there is even one pest seen. Customers will immediately begin wondering if there are pests that they are not seeing…perhaps in the food that has just been placed in front of them. This then lends to a completely unsatisfactory dining experience, and yes, you guessed it, unhappy customers. If you want to keep your employees happy, there are of course plenty of things you have to do often and well. It may have never occurred to you that you could potentially lose employees over a pest incident, however. Whether your employee finds the pest problem to be a nuisance or they simply do not want to spend their time in an establishment that could potentially threaten their health because of a pest issue, you could easily lose staff because you did not hire a pest control company. It is also imperative that you are honest with yourself about the threats that pests pose to those who are exposed to their bacteria, viruses, and more. If you have a pest problem in your commercial business, you could be posing potential harm to many people on a daily basis, which is something we know you have no desire to do. If you own a commercial space in Sacramento or in the surrounding areas, we would suggest that you call Earthwise Pest Management today! We cannot stress enough how much happier your employees and customers will be once they know they are occupying a space that is free of harmful pests. Call us today to schedule an inspection!